For removing the filter cake gathered in a pressure plate filter, vibrations are applied at regular intervals. The driving unit is shown in the top figure. Its main components are two unbalance motors, which create combined rotational and axial oscillations if the two unbalance motors synchronize out-of-phase. 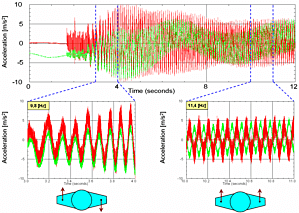 However, the synchronization of the unbalance motors is governed by self-synchronization. No active phase coupling between the motors is implemented. During tests it was observed that the synchronization changes depending on the motor speed (mid figure). The combined rotational and axial oscillations, which are desired for an optimum removal of the filter cake, take turn with an undesired tilting movement of the pressure plate filter. 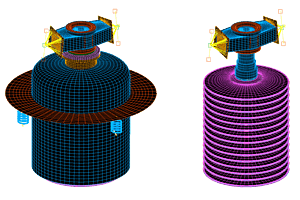 In order to investigate the reason for this behavior, an FEA model of the pressure plate filter was created as shown in the bottom figure. In the first instance unknown coupling parameters were determined by the correlation between an experimental and the numerical modal analysis. With this validated FEA model stability analyses were performed in order to predict the frequency dependant stable condition of self-synchronization. 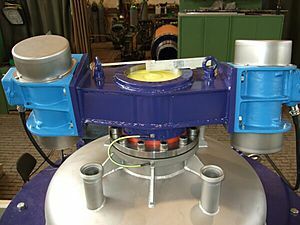 For this, the reaction torque acting on the driving rotors was analyzed for various relative phase differences between the two unbalance exciters. The multiple change of the synchronization during run-up, which had been observed in the test, was exactly reproduced analytically. At low operating speeds, the self-synchronization depends only on the inertia parameters of the filter and on the arrangement of the unbalance motors. At higher speeds, however, the modal parameters significantly influence the self-synchronization and therefore, must be considered during the layout of the driving unit.